If you upload videos on YouTube regularly them you can use the inbuilt video editor which comes on Youtube. The video editor along with enhancement section are great tools which help one in editing the videos once they are uploaded as one can add filters and apply special effects to the videos. With the recent update of Youtube, Google has introduced a new feature which will help you in blurring moving objects. Earlier it was only possible for one to blur faces in a Youtube video but now you can easily blur moving objects too. In order to use this new enhancement feature, you are required to use the desktop version of YouTube. Let’s say you want to blur the license plate of your vehicle. With this new feature of Youtube, you will be able to blur the licence plate in the video. If you are not familiar with this new feature and are wondering how to blur moving objects in Youtube videos, you can have a look at our guide below. Blurring moving objects in your videos is really a super easy task with the new custom blurring tool on YouTube. In order to blur out faces and other portions of your video on YouTube, click on the Edit option for the video you want to edit. Now you have to open the Enhancement tab and then select Blurring effects tab. This is the existing feature which was available on YouTube. If you are wondering how to blur faces in video, you have to select this option as it is going to select the face in a video and blur it automatically. Just click on the Apply button and Youtube will blur the face in video automatically. This is a new feature which is available on Youtube. Under this custom blurring feature, you will be able to select different areas which you want to blur in a video. If you are wondering how to blur moving objects in your videos on Youtube then you have to select this option as Youtube is automatically going to analyse the moving object and blur it. This feature is quite similar to the way one adds annotations and text in a video on Youtube. Once the blurring process is done you can simply click on Done button and Youtube will start processing of the video. Moving the blurred box to a different place: You can simply click & drag the area within the selected box. Resize Blurred Area: This option will allow you to click & drag the corner of the box if you want to blur small or bigger area. Change during the blurring process: You will be able to click & drag the end of a timeline which will help you in setting the beginning as well as ending of the blurring. Prevention of blurred area for moving: You can use the Lock option in the timeline as it will keep the blurred area in the same place and will prevent it from moving. Blurring Multiple Areas: You will be able to blur more than a single area in your video. Simply click & drag the boxes over the areas you want to blur in a video. We hope that now you are perfectly able to blur videos after following our guide “How to blur moving objects in your videos on YouTube”. This is by far the easiest method which will help you in blurring the faces and other portions of the video. 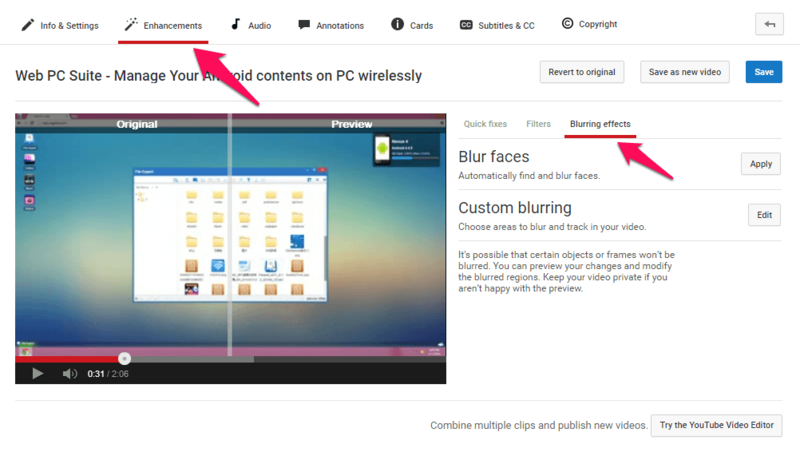 If you are having any questions or doubts regarding YouTube custom blurring tool then feel free to use the comments section below. Improve videos with enhancements features on YouTube and enjoy!